You may want to ask your users to confirm that they've answered all the questions in a quiz before they proceed to the result slide, especially if you've configured the quiz to submit answers all at once. Otherwise, if they leave any questions unanswered, the scoring will not be accurate on the result slide. Add a new slide between the last question in your quiz and the result slide. You can use one of the basic layouts for this slide. 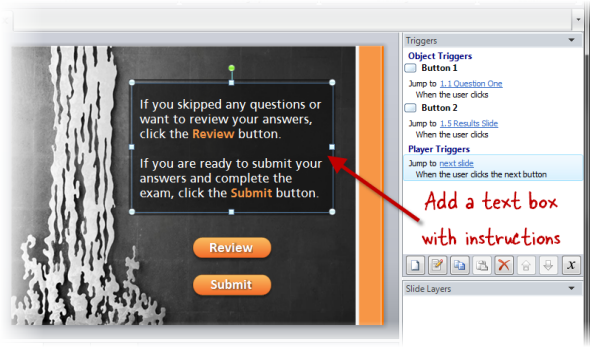 Add a button called Review (or something similar), and add a trigger to the button that jumps to the first slide in the quiz. Add another button called Submit (or something similar), and add a trigger to the button that jumps to the result slide. Click the Review button if they skipped any questions or want to review their answers before submitting them. Click the Submit button when they are ready to submit their answers for evaluation and proceed to the result slide.